With only days to go before the ICD-10 deadline, most health plans, PBMs and HMOs are ready. The results of a RJ Health Systems survey showed that 59% of respondents are ready for the October 1st transition date. 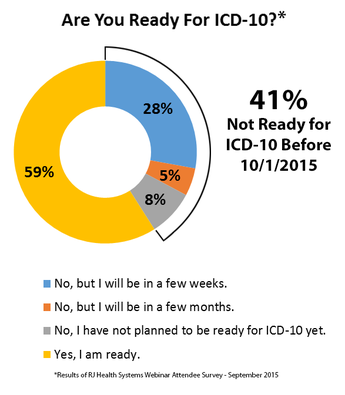 But there are still 41% surveyed who will be playing catch-up past the date, or are not even preparing for ICD-10 at all. ICD-10 implementation is a big change. The ICD-9 code set contained approximately 14,000 codes compared to approximately 68,000 for ICD-10. The ICD-9 codes have been in use in the United States since 1979. Changing adjudication and claims processing from such an antiquated code set to ICD-10 requires a lot of preparation within a large organization. The General Equivalence Mapping (GEMs), created by CMS, helps map ICD-9 to ICD-10 codes. However, it will only be maintained for 3 years post-implementation, and there is still a need for a concrete comprehensive ICD-10 code dataset. Not to mention, GEMs limits the number of diagnoses available for every drug and does not specify which codes are appropriate for claims adjudication. 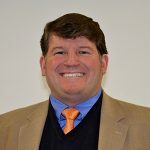 Join Randy Falkenrath on Wednesday, September 30th at 2 pm (EST) to learn more about ICD-9 to ICD-10 transition. In this webinar, Randy will address payor and provider ICD-10 readiness and compare and contrast the difference between Drug Diagnosis Coding and GEMs Mapping. Register for the webinar here.